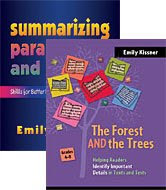 Theme presents a new challenge for transitional readers. It's not enough to just read the words and figure out who did what to whom in the story. Now they need to synthesize everything from the story to come up with a deeper meaning. For students who are just beginning to think abstractly, this is a tough task. Students can have several problems with finding theme. At first, many students try to talk about theme by using characters and events from the plot. After all, teachers say, "Use specific details!" These students are confusing theme with summarizing. Students also tend to confuse "theme" with "moral". Many stories, especially fables, have morals. But a moral is not quite the same as a theme. When authors write a story with a clear moral, there is an underlying assumption of right and wrong, and the author clearly wants the reader to do something. Theme is more open to interpretation, and doesn't have as much of an action component. Universal Themes Chart: Give students a list of common themes. Then, they can try to match stories to the themes. I've had students return to this chart again and again as they read new books throughout the year. Classroom themes chart: Use a long roll of paper and write themes across the top. Then, students can write titles that they've read (or titles from a class reading list) under the appropriate themes. The same title may appear under different themes, launching a good discussion. I love to hear students talking to each other about books that they have read and the themes they show. Students can write the titles of appropriate movies, also. Great books for teaching theme: It's so sad that picture books go out of print so quickly! I love Mole and the Baby Bird, which you might be able to find at your local library. Pumpkins, which is still in print, is a lovely little story with an easy to recognize theme. Older students have enjoyed Fly Away Home by Eve Bunting and The Memory Coat by Elvira Woodruff. 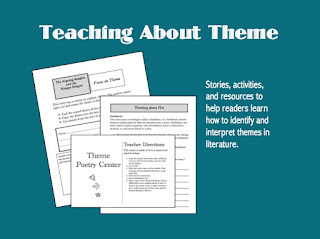 Theme in different genres: Help students to see that biographies, poems, and stories can all express themes. It's eye-opening for students to see how two texts from different genres and with different topics can express the same themes. Questions about theme: These can bring about interesting conversations. -Can a story have more than one theme? Why or why not? -Can a story have a theme that the author didn't intend? -Are there stories that don't have themes? What are they like? Theme Powerpoint: I'm trying to make my Powerpoints shorter. :) Here is one that I made to be a very simple introduction to theme. In this resource from TeachersPayTeachers, you can find three stories, lesson plans, and activities to help your readers in grades 3-6 work with theme. Thanks so much for writing this post. Please send me the universal themes list. My email address is Jparrott@paulcharter.org. Emily, Thank you so much. I used this PowerPoint for teaching theme, and my students did so well! Thanks so much for this post. I plan on using the powerpoint tomorrow to introduce identifying the theme to my second grade class. Could you please send me a copy of the Universal Themes List. I would love a list of universal themes. I teach 3rd grade and it is confusing between theme and morals. My email is tarters@duvalschools.org. I would love to have the universal theme chart. I think you powerpoint will be very helpful. Email is tgmoynihan@bellsouth.net Thanks! Thank you for this! I will use the powerpoint for my 8th grade class. I would also like the universal themes chart. kpatik@yahoo.com. Thank you so much! I really appreciate what you've put on this site! It is helpful to me since it's my first year teaching some of this stuff. I would love to get a copy of your universal themes chart if you'd be willing to mail it to me at dwright@d15.us. Thanks so much! I'm getting ready to tutor for a 4th grade FCAT group, I would love to have the list of universal themes! Thank you for sharing your awesome powerpoints! Great ideas! Can you send me the universal themes chart? pagep@gvsu.edu Thank you! I would love a copy of your universal themes chart. Can you send me a copy of your universal theme chart? Thanks for your time and for your blog. I would like a copy of your universal themes. Thank you so much for the powerpoint and great ideas! Thank you for the wonderful powerpoint on theme. Please send me your universal theme chart. Thanks!! I love the powerpoint. I would love a copy of the Universal Themes List. My email is dljohn15@louisville.edu. Please send me a copy of the universal theme list. My e-mail is twhitcraft@od.k12.in.us Thank you.....I love your powerpoint. Great powerpoint! I would love a copy of the universal theme list. My email is eamiller302@gmail.com. Thank you! I have to re-teach theme to some high school students and am going to use your PP. May I also have a copy of your universal themes list? Please send it to whiteh@highlands.k12.fl.us. Thanks! Thanks for the great powerpoint! Please send me your universal themes chart. Great ideas! May I have a copy of the universal themes chart? galloma@watertownps.org Thank you! Please send me the universal themes chart! Thanks. I would love a copy of the universal them chart. Thanks! This helped alot. The power point is excellent! May I please have a copy of your universal theme chart? I really appreciate you sharing thepresentation. I think my kiddos are really going to enjoy this. If possible could you send me the universal themes chart? Thanks in advance. Can you send me the list of universal themes too? Really appreciate the help - thanks! So glad I stumbled across your blog! I am working on theme with my students and would LOVE a copy of your Universal Themes chart. Keep up the great work! i would love the chart if you have time! Love this! I am working on theme and would love a copy of your universal theme chart. My email is carrute@gcsnc.com. Could you please send me a copy of the Universal Themes Chart? My email is marija.crosson@dc.gov. I would really appreciate a copy of your universal themes chart. Thank You so much for your blog! I find it very helpful in the teaching of reading. My email is dgrebner@schools.mtco.com. Thank YOU! I would love a copy of the universal themes chart. It would be a wonderful resource for my students. My email address is thinkpositivethoughts07@gmail.com. Thank you! I would love a copy of the universal themes chart. It would be a wonderful resource for my students. My email address is olivatirsa@yahoo.com Thank you! Would love a chart. Many thanks for the wonderful guidance. It would be really wonderful to have your universal theme chart. If you could please send it to me, I would be forever grateful. My email is jeremyharrison00@gmail.com. Thanks!!! Terrific powerpoint, Succinct and clear! Can you send me your universal theme list please? I, too, would like the universal theme list. Thanks for sharing your wealth of knowledge. I found this post really helpful! Would you please send me the Universal Themes Chart? I am also interested in receiving your Universal Themes Chart. Thank you for offering it to those who contact you. Hope I'm not too late. I enjoyed your Themes slideshow too. Will you please send me the universal theme chart? Thanks so much! I would love the universal themes chart. Thank you! I would appreciate a copy of your universal theme chart. Send to cleyva@phoenixunion.org Thanks so much. Oftentimes even the experts don't give the correct information; they end up mentioning subject/topics and claims those ideas as themes. Love your powerpoint! Could you send me a copy of the universal theme chart to jbalzano@lbeach.org. Thanks so much! I've been teaching for 35 yrs now! Teaching theme is STILL hard to teach! I'm thankful for any new or solid ideas that I can get my hands on! Thanks!